CLEAN energy generation in India received a fillip with the commissioning of the countrys first solar power plant in Jamuria near Asansol in West Bengal in August. 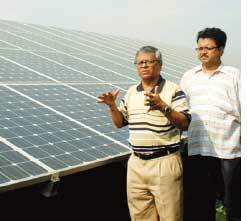 It is currently working at half its installed capacity of 2 MW. What is unique about this project is that this is the first time in the world an abandoned coal-fired power plant has been converted into a solar one, said Santipada Gon Choudhary, chairmancum-managing director of West Bengal Green Energy Development Corporation (wbgedc), a government subsidiary that commissioned the plant. The 6MW coal-fired plant, spread over three hectares, was abandoned in 1997. Choudhury said the plant has been linked to the power grid. wbgedc plans to earn carbon credits (Rs 3 crore per MW in 10 years) through this project that cost them Rs 35 Crore.With every hour of electricity production through solar power, 10 tonnes of carbon emissions can be averted, Choudhury said. The tariff for the solar power has been kept at Rs 5 per unit (as fixed by the State Electricity Regulatory Commission). The low tariff was made possible with the Rs 10-per-unit subsidy from the Ministry of New and Renewable Energy. The production cost of a unit of electricity is Rs 12. A senior engineer with the power supply corporation said the plant supplies 750 kW power during peak hours from 11 am to 5 pm on a normal sunny day. The project was executed by a company from Hyderabad in collaboration with a German firm.